In 1856 New York, Heather Fitzpatrick, a bashful abolitionist, falls for young Army lieutenant David Whitman, who is tracking a runaway slave—the very slave she and her parents rescued from the hands of the slavemongers a few nights earlier. Despite their divergent views on slavery, romance ensues. An engagement quickly follows. After his father passes, his mother insists any marriage will have to wait the requisite year, which is proper for mourning. Heather longs to stay with David to wait out the year, since his mother has other plans. But she knows the South is no place for an abolitionist. Lovely site, Mickie. Becky's novels are superb! 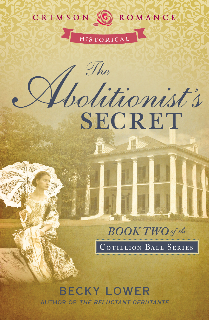 I loved her first book, THE RELUCTANT DEBUTANTE, and I'm looking forward to the second novel in the series, THE ABOLITIONIST'S SECRET. Readers, if you love historical fiction, adventure and romance, you will adore Ms. Lower's stories!